One of the ways His Little Feet encourages you to impact the lives of orphans around the world is to consider sponsoring through Compassion International. When you sponsor a child, their life is transformed in an amazing way. Through the sponsorship, the child is provided with food, clean water, medical care and more. And most of all, sponsoring through Compassion gives that child the opportunity to hear about Jesus Christ. Below is a powerful story of how lives were changed through child sponsorship. 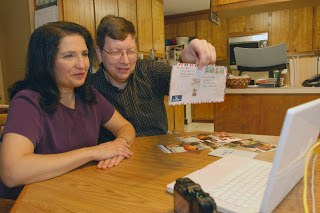 For more than 20 years, Wolly Towoliu prayed for a miracle — to reconnect with Bob and JoAnne Cottone, his former sponsors in the United States, and give them a thank-you letter returned to him in 1989, unopened. When Compassion photographer Chuck Bigger met Wolly in Indonesia recently, the miracle was set in motion. 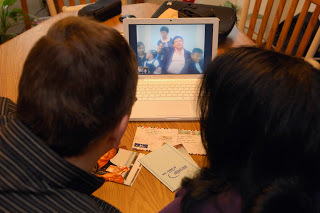 Chuck hand-delivered Wolly’s letter to the Cottones and reunited them on Skype, an Internet communications program. “I was in shock!” says JoAnne Cottone, recalling the day last spring when she and her husband, Bob, received a phone call from Compassion. Chuck Bigger had just interviewed their first sponsored child, Wolly Towoliu, whom they hadn’t heard from since the Compassion-assisted child development center he attended closed in 1983. Although disappointed, Wolly saved the letter as a reminder of the many “returns” he’d received from his sponsorship. Wolly’s prayer for 20 years was that one day he would be able to tell Bob and JoAnne in person how much their sponsorship meant to him. When Wolly’s center closed in the early ’80s due to violence in Indonesia, “It was devastating,” JoAnne says. “It felt like we’d lost one of our boys.” The Cottones still fondly remember Wolly’s engaging letters. “We always wondered what had happened to Wolly and had often thought of him,” Bob says. Both soon learned just how much Wolly had thought of them, too. On April 10, 2009, Good Friday, Wolly and the Cottones experienced their own Easter miracle. Chuck Bigger delivered Wolly’s thank-you letter to them. He also helped set up a reunion via Skype. 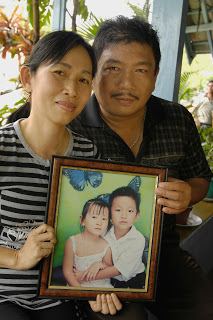 From their kitchen in Raleigh, N.C., Bob and JoAnne spoke with Wolly in Indonesia through a Compassion translator. Wolly’s wife, Ike Ingkiriwang, son, Winston, 9, and daughter, Kezia, 7, also were there. For more than an hour the families laughed and cried together. Wolly expressed his deep gratitude to the Cottone family. He also told them of God’s faithfulness over the years. After his Compassion center closed, Wolly’s widowed mother found work as a seamstress, helping to pay for her only child’s high school, and later, his law school tuition. When she died in 1996, the young lawyer returned from Jakarta to the family home in Manado, began his own business, and met his future wife.Today Wolly runs a thriving agribusiness, which has more than 30 employees and sells 30,000 chicken eggs a week to local shops. He also owns a prosperous coconut oil production plant. But more important, Wolly says, “I have a fear of the Lord, and I am bringing up my children to attend church.” He credits the Cottones’ letters for his remaining steadfast in his faith. Please consider sponsoring a child through Compassion International. Click here to change a child’s life today. And if you already sponsor a child through Compassion International, join us by being a voice for the voiceless,and send this blog link onto a friend or family member, inviting them to sponsor a child today!